A young moose, probably just booted out of camp by his mother, wallowed in a swamp while a curious but imprudent male photographer moved among the reeds between the moose and Route 16. I pulled over and stopped to watch this pair. 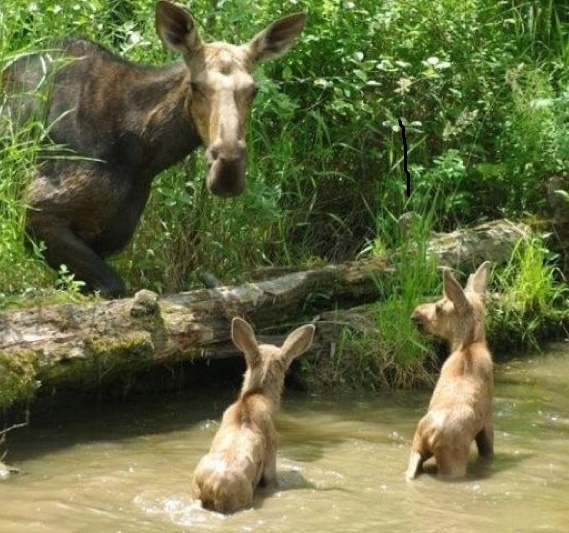 Perhaps it was the long lens and the bulky pack adorning the photographer, but I swear that fledgling moose thought his mom had returned for him. With muck-sucking slap-dashery, the moose ventured toward the young man who slowly began a retreat toward the highway, filming all the while. As the moose closed the gap, the man, looking slightly nervous (whites of the eyes, jaw slacked, fumbling) arrived at the guard rail and cleared it seemingly effortlessly, camera gear thwomping ribs, hips and backside. He crossed the road in front of me, turned and headed with great purpose down Route 16 toward the AMC parking lot. The moose, sensing that this newfangled “mom” may escape, followed, intent on connecting with this man in a way that only a juvenile moose could dream up. I now began to follow both photographer and moose as their pace noticeably quickened. If you have ever followed a trotting moose down a road, (particularly in pursuit of a terror-stricken nature lover) you know how hilarious they might look from behind. The man now seemed a little frantic, glancing behind at the love-struck moose which rapidly gained ground. They turned in tandem into the AMC parking lot. Perhaps not five minutes earlier, a tour bus had arrived carrying 100-plus camera bedecked Japanese folks who were milling around waiting for breakfast. Suddenly, Man and Moose descending upon the scene, initiated a stampede of young and old who leapt, soared, hurdled and vaulted on top of whatever appeared to be at hand. As much as they may have hoped to view wildlife, they were not prepared for this! The melee allowed the photographer to lose himself in the crowd while the moose pivoted first to the right, then left, then right again, casting sadly about for his man-Mom. As cameras clicked and videos whirred, the poor flummoxed moose wandered distractedly down the drive and into the woods. I was reminded of this event by the news a few days ago that 75 percent of last year’s crop of young moose did not survive the winter, and to add to that, three moose had already been killed by cars this spring. The increasing mortality on moose across the northern tier of the U.S. has meant rapidly declining numbers of this, our largest land mammal. The causes of the decline are disputed but the ruling theory is a double punch of climate change and winter ticks. New Hampshire is at the northern end of the white-tailed deer range and the southern end of the moose range. Usually habitat and severity of winters determine deer and moose numbers, but climate change tips the scales, particularly for the moose. While deer evolved with ticks, they have adapted by “learning” to lick the ticks off before they gain hold. According to Chris Rines, the NHF&G Moose Biologist, it could take moose 1,000 years to learn this tick trick, but in the meantime, the climate is changing faster than these animals can adapt. Perhaps NHF&G should call off the moose hunt for 2016. Even allowing fewer permits takes sorely needed individuals out of the gene pool. Conservation means wise use of resources. NHF&G and the hunting community should step up and stand down on the hunt. Conservation Biologist Christine Schadler explores her passion for coyotes and wildlife and how people and animals share turf in the Granite State in her InDepthNH.org column Howling from the Mountain. 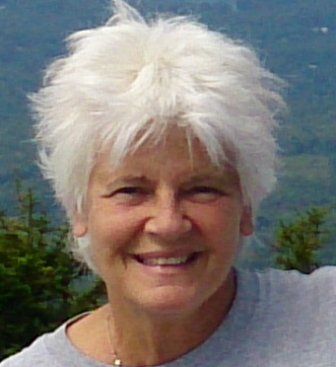 She is the representative for Project Coyote in New Hampshire and Vermont, and a science adviser to the Northeast Wolf Coalition. She divides her time between teaching and working on her book “Becoming Wolf.” Between presentations on coyotes and wolves, she can be found at camp in northern New Hampshire researching coyote feeding patterns or leading trips into Ontario to track wolves.